It is perhaps ironic that this story of women fighting for their inalienable rights is being told on the big screen given that the film industry remains one of the most discriminatory and misogynistic industries in the western world. This is an important story that is only rendered all the more relevant by the fact that the female cast members who populate the production are invariably paid far less than their male counterparts. 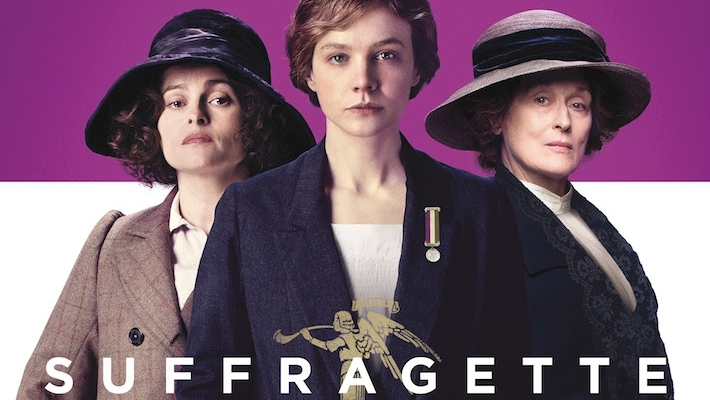 It seems incredible that, despite the struggles and sacrifices of the women portrayed in Suffragette, women continue to suffer financial and social disadvantage at the hands of a patriarchal political system. Certainly, Jennifer Lawrence complaining about being paid less than her male co-stars is well and good, but the women of this story did more than merely complain, they sacrificed their jobs, their families, their freedom and their health in pursuit of a fundamental right to participation in the political process. No doubt most people have a rudimentary knowledge of the Suffragette movement of the early 20th century led by Emily Pankhurst (played here by Meryl Streep) and the incident at Epsom that saw Emily Davison lose her life in a bid to bring their cause to the attention of King George V. In Suffragette, Pankhurst only appears briefly as the story focuses on the women who carried out a campaign of civil disobedience at her behest. One of these women is Maud Watts (Carey Mulligan), a young wife and mother whose involvement in the movement comes almost by accident. Having worked in the same laundry since she was 12 years of age, Watts observes the inequalities of the world around her as a neutral bystander, looking the other way when her boss harasses his female employees. It is the arrival of the outspoken Violet Miller (Anne-Marie Duff) that leads Maud to become emboldened and challenge the inequities that women endure; the indignity and exploitation inherent in a society controlled by the men who roam the corridors of power. Maud transforms from somebody with little interest in the movement to being one of its key activists and director Sarah Gavon shows considerable restraint in her rendering of Maud’s transformation from trusting employee and dutiful wife to political activist. As Maud becomes more active within the group, she draws the attention of the authorities, most notably Inspector Arthur Steed (Brendan Gleeson), a vile piece of work whose task it is to stop the Suffragettes from committing acts of wilful destruction in an effort to draw attention to their cause. There is a luminous presence about Carey Mulligan that lights up the screen whenever she is on it and that is the case once again here. Like others before her (such as Thomas Vinterberg with Far from the Madding Crowd) Gavon utilises close-ups to catch the subtlest of facial movements and emotional tics that Mulligan is so adept at articulating. It is easy to get caught up in Mulligan’s allure and lose sight of the plight of her character, who ultimately sacrifices everything in the pursuit of equality at the ballot box. Helena Bonham-Carter produces one her least manic performances in a long time as fellow activist Edith Ellyn, with Natalie Press as Davison and Romola Garai as Alice Houghton, an upper-class suffragette who advocates for women’s rights but is not subject to the consequences of protesting due to the influence and power of her politician husband. With the exception of Edith’s loyal and supportive husband Hugh (Finbar Lynch), the men don’t fare well here. Maud’s husband Sonny (Ben Whishaw) casts her aside, her boss preys on the women at the laundry with impunity and the politicians who invite her to address them are disingenuous in their efforts to facilitate change. This is a film about women, by women (written by Abi Morgan) and that in itself is worth celebrating. With a strong central performance and a production design that evokes the hardships endured by the working class in London at the turn of the century, this is a solid rendering of an important period in history. It’s just a shame that, despite the sacrifices made, we are still a long way from achieving any real sense of gender equality some 100 years later.